Halong Bay's name refers to a dragon that descends, and it has long been a site of mythic significance to the Vietnamese. Dragons have long been sacred to the Vietnamese, who believe that they are descended from the union of the dragon god Lac Long Quan and a beautiful goddess of the mountain, Au Co. Similar legends abound about the creation of Halong Bay. One ancient story tells of a powerful dragon that flew from the mountain to the sea, its fiery tail carving out valleys and gorges, before it dived into the sea. The splash caused the sea to flood the landscape, leaving only the tips of the hills peaking out as islands. Another recounts the tale of the early Vietnamese fending off invaders who came by sea. To help them, gods dispatched a mother dragon and her young, who started spitting out pearls from their mouths. These pearls turned into the islands and pillars that jutted out from the sea, blocking off the passage of the ships. Whatever the story is, Halong Bay clearly emerges as a very special place unlike any other. And in fact, researchers and scientists have found that Halong was one of the earliest cradles of civilisation in Vietnam, thanks to its rich biological diversity of rainforests, mangroves and coral that supported vegetation and animals, making it a good place for ancient humans to live. Evidence of many ancient cultures and Vietnamese ethnicities have been discovered here, like the Soi Nhu, Cái Bèo and Halong culture, all which date far before 1500 B.C. 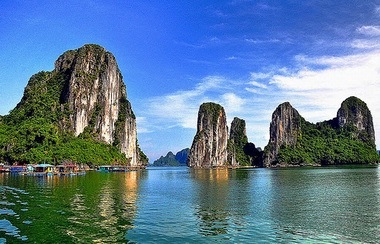 In Vietnam's history, Halong Bay is also an important place. It is the home of the historical port Van Don, and a place where heroic ship battles took place to protect Vietnam against foreign invaders. It was here on Bach Dang River that General Tran Hung Dao planted sharp wood stakes in the water during a Mongol attack. These stakes punctured the hulls of Kublai Khan's ships, causing them to sink in the river. In this clever way, the general kept his people safe from the relentless attacks of the Mongol army. Culturally, Halong Bay is also very important as a place that inspired artists, poets and scholars who shaped Vietnamese culture and history. Poem Mountain is covered with carvings of poems celebrating famous Kings and legendary heroes and warriors. The famous scholar Nguyen Trai also immortalized Halong Bay in his poetry as a wonder of Vietnam. Today, Halong Bay is inhabited by fishing families, numbering to about 1,600 across four floating villages located in quiet coves. These villages are centuries-old, lived in by generations of fisherman, who have never left Halong Bay, but enjoyed the protection of the mountainous isles from storms and rough weather. In this world, young children swim before they learn to walk, and at an early age, they start to steer and row their own little boats, made of bamboo baskets.